I understand that different libraries do things differently, but I've never seen this. While helping a patron look for a book yesterday, I ended up searching in the state-wide library catalog, the Virtual Catalog. 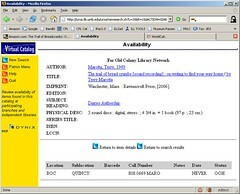 Since it searches "all" the libraries in Massachusetts, many of which are running different computer systems, you often see some oddities in the catalog records. In the date field towards the bottom, most books will display the date they are due, if they are checked out, or just read "Available" if they are checked in. Imagine my surprise to see when this book was due - Never!